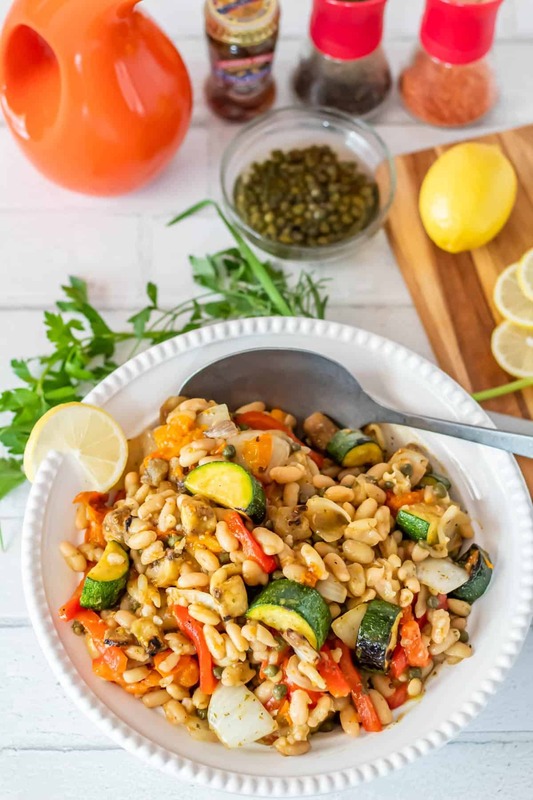 A healthy new spin on the classic “bean salad,” Summer Flageolet Beans with Grilled Veggies Provençal combines prized heirloom flageolet beans with grilled summer vegetables, capers, and a tangy anchovy and dijon vinaigrette. This bean salad is sure to liven up your summer menu! 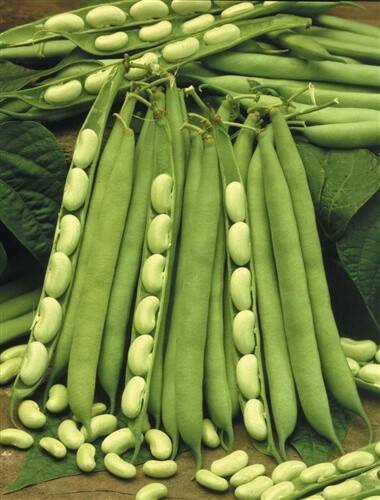 Flageolet beans – aka “caviar beans” – are tiny, tender, robust beans that originated in France. This French bush type bean has an inedible pod with small kidney shaped beans. The beans (seeds) may range in color from white to yellow to black. The most prized, however, are the flageolet vert or green flageolet. The beans can occasionally be found fresh in summer, and if you are lucky enough to find them fresh, they may remind you of fresh limas. They can be fresh-frozen and treated like peas. Most commonly, though, you will find them dried. Flageolets pair really well with lamb, and they’re awesome in cassoulet. 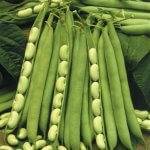 You’ll find they work well in any recipe specifying white beans (navy, cannelini, great northern). You’ll find white beans in my Instant Pot Cannelini Beans with Penne, Baby Kale, and Slow Roasted Tomatoes, Tuscan Fish with Cannelini Beans, Tomatoes, and Spinach, and Make-Ahead Pressure Cooker Cassoulet. 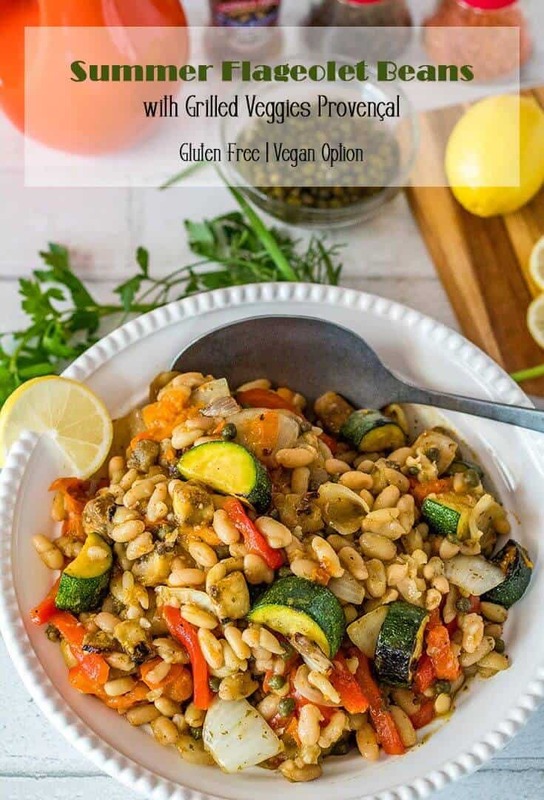 Try flageolet beans in any (or all 🙂 ) of them! I regularly look to Bob’s Red Mill products for new items/ingredients. 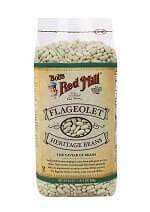 I was not a bit surprised to find the Heritage Flageolet Beans on their website along with several other bean options. Keep in mind that if you cannot get the flageolets, any white bean is an excellent substitution. This recipe would also work well with their baby lima beans. Cook the flageolet beans. I highly recommend using your pressure cooker/Instant Pot. I don’t pre-soak. The “jury” is out on this, but I’m ALWAYS happy with the results. I cook the entire bag of whatever beans I’m cooking because I LOVE having them in the refrigerator or freezer for later use. They beat canned hands down. I put the bag of dried flageolets in the pressure cooker, cover with water to the max fill line, and using manual, set to 35 minutes. Do a “natural” pressure release. Keep in mind, the “no soak” method may not be consistent in appearance in texture (ie. you may have some “blow out” beans). If appearance is important, soak the beans overnight. If by chance your beans are still too firm, give them another 10 minutes under pressure. Bean cooking times can vary due to humidity, variety, quality, etc. So get the beans cooked. If you just can’t start with dried beans, rinse a couple of cans of beans. Whisk together that amazing vinaigrette, prep the veggies, and get your partner to grill them. 😀 Haha. That’s what I do. 😉 Then toss it all together in a bowl. Shortcuts you ask? Well, I prefer to char my own red bell pepper, but piquillo or roasted red peppers in a jar are definitely a fine substitute. Capers are a must in this recipe, so pretty please don’t omit them. ANCHOVIES. This is a Provençal dish, and the flavor of the anchovies, lemon, and herbs are imperative. I hope you’ll include the anchovies in the vinaigrette! 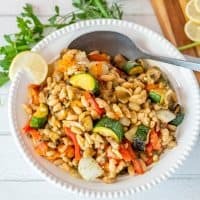 A healthy new spin on the classic "bean salad," Summer Flageolet Beans with Grilled Veggies Provençal combines prized heirloom flageolet beans with grilled summer vegetables, capers, and a tangy anchovy and dijon vinaigrette. This bean salad is sure to liven up your summer menu! Prepare the beans if they're not yet prepared. Add the eggplant, zucchini or yellow squash, tomatoes, and onion to a grill basket. Grill over medium high until tender with nice grill marks. Char the red bell pepper (unless you're using one from a jar). Remove the charred skin, stem, and seeds, then slice. Add all dressing ingredients to a small blender or processor. Blend well. Taste for seasoning. (This is SO IMPORTANT!). Add all bean salad ingredients to a large bowl. Stir to combine. Add the vinaigrette as per your preference. Garnish with lemon slices and additional herbs as desired. Beans can be soaked overnight and cooked on the stove, but my preferred method is with my pressure cooker as they're done start to finish with no pre-soak in about an hour. As I mention in the post, I usually just do the entire bag, and freeze what I don't need. These instructions from Bob's Red Mill include both methods. If you can't find flageolet beans, substitute navy or cannelini. I stress the superior texture of using cooked dried beans over canned, but you can substitute canned in a pinch. It'll still be a good dish. Eggplant comes in many varieties. If I use a large globe shaped eggplant (typically found at most groceries), I cube it, salt it generously, and leave the eggplant in a colander to "sweat" for 30-45 minutes. Then I rinse thoroughly. I find this process reduces some of the weird mouth feel of some eggplant varieties. On the other hand, if I've been to the farmers market, and have some lovely small eggplants, I skip that process! 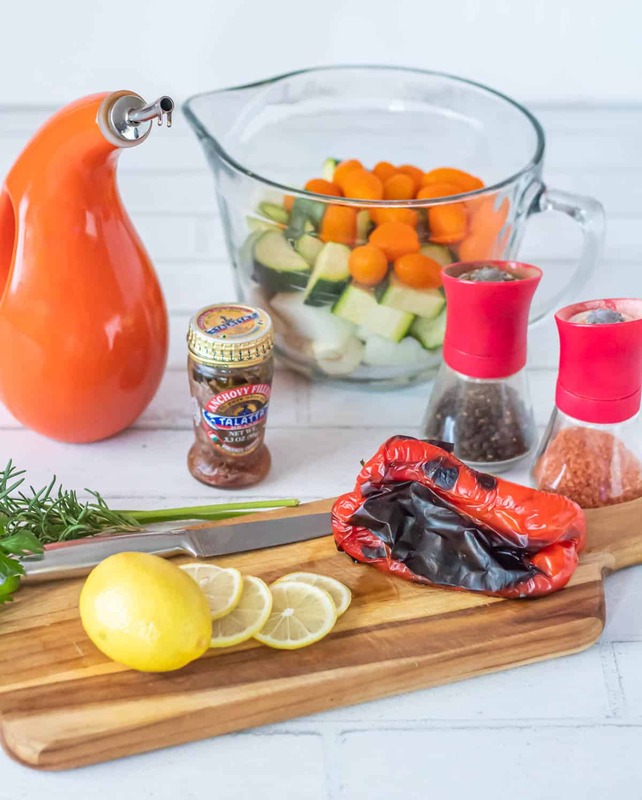 I prefer to char my own red bell pepper, but I have been known to sub a pepper from a jar. I like piquillo pepper as they seem to hold their shape better. When I make a vinaigrette, I typically go for a 1:3 ratio of acidity (lemon juice, lime juice, good vinegar, etc.) to good oil (olive, nut oil, truffle or other artisan oil). I do taste and add (can't subtract 😀 ). For this vinaigrette, I like a combination of lemon juice and white wine vinegar. I squeeze the lemon into a measuring cup, and then add the vinegar to bring it to 1/4 cup. We don't dress salads heavily, so I store remaining dressing in a mason jar in the refrigerator. It is the anchovy, lemon, caper, herb combination that gives this dish its characteristic Provençal flavors. If you just can't handle anchovy, omit it, but don't tell me. 😉 Note: Anchovy is not vegan, so omit it if you're following a vegan diet. I serve this atop baby greens, but that is definitely optional! Macronutrients (approximation from MyFitnessPal.com): 228 calories; 6 g protein; 15 g fat; 17 g carbohydrates. Macros based on serving as a side dish for 6 using half of the vinaigrette. What a beautiful dish! I've only had dried flageolet beans, unfortunately. They look so beautiful fresh. Such great flavors and textures here. Perfect for summer!